Facilitated by David Kallick of the Fiscal Policy Institute, this discussion will feature findings from the FPI study, “Bringing Vitality to Main Street: How Immigrant Small Businesses Help Grow Local Economies,” and immigrant entrepreneurs from the WE Global Network’s “A Day in the Life of an Immigrant Entrepreneur” publication. This interactive workshop informs and engages participants around issues at the intersection of race, citizenship and immigration. Participants learn about the US history around race, personhood and immigration. Through facilitated discussion participants learn innovative strategies of multi-racial alliance building and creating grass-roots solutions to address systemic inequality and institutional discrimination. Welcoming and immigrant economic development programs operate in communities with varying policy contexts. Some initiatives have extensive engagement and support from political and elected leadership, others operate without much interaction from government leaders, while still others may find the scope of their activities restricted by state or local immigration policies. Each context presents a unique set of challenges and opportunities that can affect the ability to marshal resources, build community sustainability, and impact the intended population. This panel seeks to explore how such initiatives can maximize their impact across differing state and local policy climates. This session will discuss how community-based organizations can collaborate with higher education institutions to better serve the diverse needs of immigrants and refugees. Program models and promising practices from across the country will be highlighted and you’ll leave with practical ideas, recommendations, and resources that are useful for creating new opportunities. Refugees compose a significant proportion of the foreign born population in the Rust Belt region. While many come with an entrepreneurial spirit and demonstrate incredible personal resiliency, they need help to achieve their economic potential. This session will explore how refugee service providers and mainstream organizations with an interest in economic development are coming together in partnership to deepen refugees’ economic impact in the community. In this session we will explore examples of three partnerships currently underway. This session will engage all participants in a robust dialogue – the WE Global Network wants to hear from you. Share your ideas about what the Network could provide for your immigrant entrepreneurship programs, and help guide the direction of WE Global Network’s support services. The White House Task Force for New Americans’ recently released immigrant integration action plan announced the creation of a Building Welcoming Communities program, encouraging local collaborations to bridge immigrants and receiving communities and to help advance economic, civic and linguistic integration. Come learn how communities across the region are already working across sectors to advance welcoming communities and how your program can be part of the White House’s new opportunity. International students at American colleges and universities represent a growing segment of the talent pool that companies and metros need to compete. In fact, the nearly 900,000 international students and their families at U.S. colleges and universities are estimated to support 340,000 jobs and contribute nearly $27 billion to the economy. Recently, the Ohio Board of Regents released a report noting that increasing retention of Ohio’s international students after graduation could add almost $100 million and 1,000 new jobs to the state’s economy. This panel will chronicle the insights of the Ohio Board of Regents report, as well as best practices at Case Western Reserve University and the Michigan Global Talent Retention Initiative. Many communities struggle to ensure that immigrants and refugees themselves are full participants in shaping efforts to welcome and integrate newcomers, as well as becoming effective advocates for their communities in American society. Community based ethnic organizations (mutual aid organizations) are one vehicle frequently seen. Yet individual organizations struggle to meet the basic needs of their own community, and may not identify anything in common with those from a different country-of-origin or ethnic background than their own. Last, some localities have ethnically specific groups, others have created multi-ethnic organizations. Finding ways to encourage and support people to work across ethnic lines towards a shared purpose is increasingly important – yet challenging to accomplish. In this session, we’ll zero in on the case of Buffalo, New York, where a number of efforts have been underway to foster refugee and immigrant leadership, community engagement and collaboration. Using Buffalo as a case study, we’ll explore the role of ethnic-based community organizations, cross-cultural coalitions and service providers in fostering cross-ethnic collaboration and a welcoming community. Research has highlighted that language access and cultural competence are the two most important features of business development programming for immigrant entrepreneurs. As many Rust Belt cities aspire to revitalize vacant or distressed neighborhood commercial corridors, this panel discussion will explore mainstreet strategies for local businesses and individualized approaches to building meaningful relationships with immigrant entrepreneurs. Public organizations have a responsibility to ensure that individuals with limited English proficiency (LEP) can effectively access and utilize important information and services just as those who are fluent English speakers. This session will foster an interactive discussion among participants about the challenges and successes of providing language access for individuals with LEP. Participants are encouraged to share their own experiences and questions regarding language access. The group will also discuss ways that the WE Global Network can support and strengthen the language access efforts of your own agency or organization. Welcoming America is using the WE Global Convening in Dayton to release the first-ever Guide to Immigrant Economic Development to help local economic development practitioners, local government, immigrant welcoming programs, refugee resettlement agencies, and others implement and hone immigrant economic development programs. The Guide explores ways in which organizations that are new to this work can begin to bring an economic lens to broader integration efforts. This highly interactive session will give participants an opportunity to share promising practices and challenges with each other related to their own communities. We’ve all heard stories about a doctor working as a dishwasher, or an engineer driving a taxicab; and have likely wondered how to appropriately serve the high-skilled immigrant population. This workshop is designed to help us better understand the current barriers and opportunities facing skilled immigrants and providers. Stacy Simon, IMPRINT, and Amanda Bergson-Shilcock, National Skills Coalition will provide an overview of the current landscape, including information on how WIOA provides new opportunities to serve high-skilled immigrants. A panel of practitioners from the field will discuss how they have secured government funding to serve skilled immigrants and will share lessons learned. This workshop will address challenges and opportunities law enforcement agencies have when trying to effectively gain the trust of diverse communities. Discussion will revolve around community-policing, immigrant-friendly policing policies, language access, and the importance of diversity during hiring and training of new officers. Participants will hear about over-arching philosophies, specific policies and protocols, and lessons learned in implementation plans. Rust Belt cities have faced a half century of economic and social challenges that have left many distressed neighborhoods. Immigrants and refugees have been a part of stabilizing urban communities across the Midwest and Northeast. 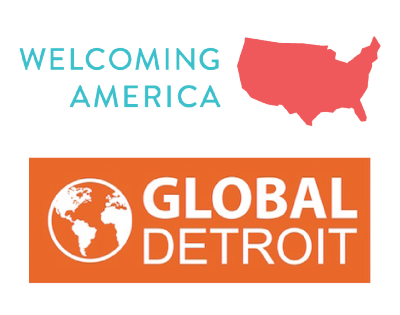 Hear how exciting new efforts are being launched in WE Global cities to capture the energy and opportunity that immigrants and refugees bring, especially with regards to rehabbing and occupying vacant housing. This affinity group will address how demographic changes may have altered community dynamics in neighborhoods and how community building activities can help ensure everyone feels welcomed. Specific initiatives will be highlighted and individuals will discuss effective tools they have used in creating welcoming communities. Affinity group sessions will be heavily participatory. Questions will guide the dialogue, and all attendees will be encouraged to share their insights and experiences. Convening reflections from WE Global Network representatives.